Hi Maestreans, we have some upsetting news. When we did the server transfer we came to the unfortunate realization that our hourly backups have been crashing due to a rate limit we did not know about. The database somehow got wiped, and we have no backups. This was in no way intentional and was a mix of several things going wrong at the same time. This means: Jobs, LWC, Achievements, McMMO, Ranks (Donor and in-game), Permissions, Titles you've used & Towny data (Towns, residents, plots) has been deleted. Even on Skyblock. What wasn't deleted: The world, items(inventories, backpacks, enderchests), Skyblock islands and challenges. While we were determining our options we found that a hard reset would have to happen in the future to update to 1.13. More information about this can be found here. We also found that the cons outweighed the pros on keeping the world. Essentially the server would become a grief fest with anyone being able to take anything from any town they had a home in. All purchased donor ranks and perks will be redistributed. Architect, Headless, & Bartender will be given back to those that have won those competitions. Allow people to visit the 1.12.2 world in spectator mode to retrieve schematics of their builds. 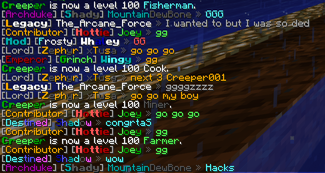 Skyblock ranks will be refunded upon supplying admins with logs of ranking up. A buffed starter kit will be given to anyone joining the server in the first two week. Giving the Submerged title to those who joined prior to July 24th (post here). We deeply apologize for the work that has been lost, and that we weren't careful enough regarding the move. We know we've always told you guys that a reset would NEVER happen, and this goes against that promise in all ways. We're sorry for all the time spent going to waste and not letting you guys know any sooner. The plans are to get the permissions and groups setup allowing you guys to join the hub, Skyblock and creative till we fix plugin issues for 1.13. We're hoping this will take as little time as possible, but the ETA will probably be at least after next Monday the 30th July. TL;DR: Towny is being 100% reset. New map, cleared inventories, backpacks, enderchests, ranks. Donation ranks are remaining. Old map can still be accessed to schematica builds or use WorldDownloader. If you need help with using the mod, feel free to contact myself or another person willing to help! Sorry, we decided that it would give people an unfair advantage if we were to WorldEdit builds in to the new world. Additionally, it would be a huuuge load on the staff. So far, I've clocked around 14 hours yesterday and 9 hours today setting up permissions alone. I got no reason to not say that im sobbing a lot right now.. I can't prove everything that i got.. This is a bit heavy..
At first, it's very sad. But when you think about it, it's kinda nice knowing that people have been working very hard to get the server up and make sure everyone is happy! Eyo, how are you? you having a good day? Yes, it's very sad. Luckily, the Content team & staff team are working extremely hard to get everything up and running. @CsoiSauce what about buy town claim's, my town had 1150 of them, however not all bought by me, that will no longer be able to get, but that is 140+ residents what also will not be able to get if something then those 1150 claim I would like to get back to my town. 1.) I’m so sorry for everyone. I know how much was lost. Hell, I lost all 56 books that were in the Erebor Library. All that knowledge, gone. I hope I can help everyone move forward, and I hope others will do the same. I’ll be rebuilding the library, bigger and better than ever- if you need a distraction, come write or build. 2.) If proof of title ownership is submitted, can titles be retrieved? 3.) Is there any way at all I can get those 56 books back? They might not look like much, but it’s 56 books worth of players and the server and history and everything I spent a year collecting. Any way at all? Town claims will be added back, unfortunately it will only be the claims you purchased, but if your 40+ residents that donated for those claims want to re-add them to your town they can! 2.) No, we will not be refunding titles nor In-Game ranks. 3.) Sorry, we can't . However, with enough materials myself and the staff team can write 57 random books for your library! I bought claims for DyrpiDyrpi since Tran's claim issue was never resolved. Do I get a refund for the $70 that is now wasted? Scythe578: Our gerbil died, we're waiting for a new one but once we get it maestrea will be back up! Bloody hell. Well, I meant what I said and I said what I meant- now's the prefect time for a library if you think about it. The world is fresh and new, and books are being written, not found or hidden away in dusty remnants of towns. If anyone needs anything at all, I'm here. If you wanna talk or just write or help build, tpa. After all, you'll be helping write history.